I rigged the W500 to row or sail and can add my 30 pound trolling motor if the wind continues to quit too far away for an easy row back. 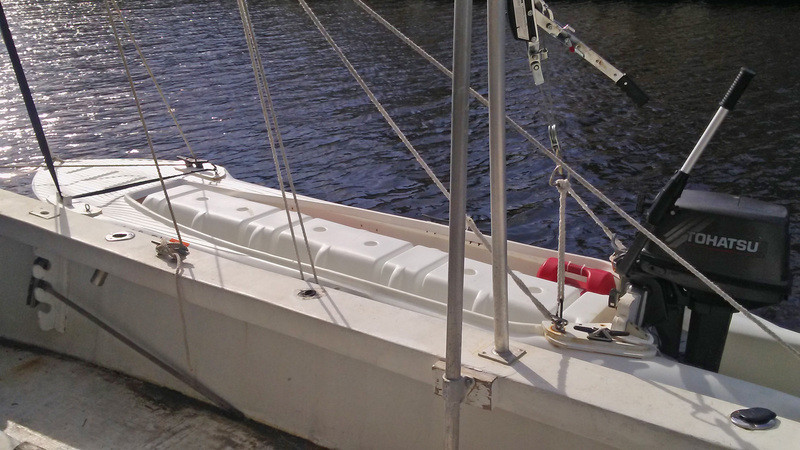 A pair of smaller sealed batteries are perfect for twin hulls, and sitting a couple of inches forward balance it all. A cross bar gives the oarlocks a four-foot spread and removes with two hand knobs, so the boat passes through the back door. It goes in my Honda with the front seat folded and rolls on a pair of 9” tires from (something) tucked between the hulls on PVC pipe held up by bungee cords. 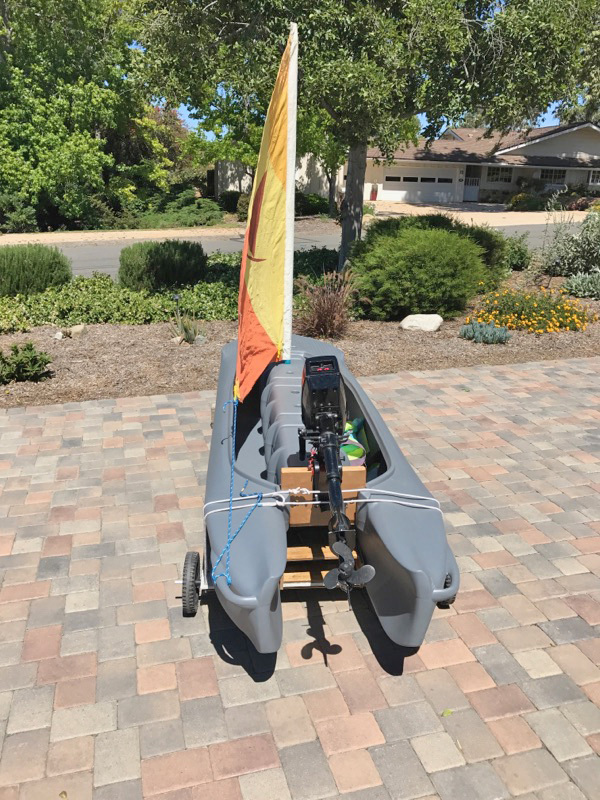 A box like your motor mount is the base for a 45 square foot Snark lateen sail I had, and drops down about as far as the big foam noodles underneath. Those even match the ones around the coaming, which are smaller, so I can get my big feet between them and the seat! We took the Wavewalks out sailing again and my wife got pics on her phone. A year ago today, Hurricane Irma blew through. Today, my wife and I took the Wavewalk fleet out to snorkel the wrecks of Garden Cove under a rather cloudy sky. Still, it was a wonderful peaceful day. Hopefully, the video will show so. 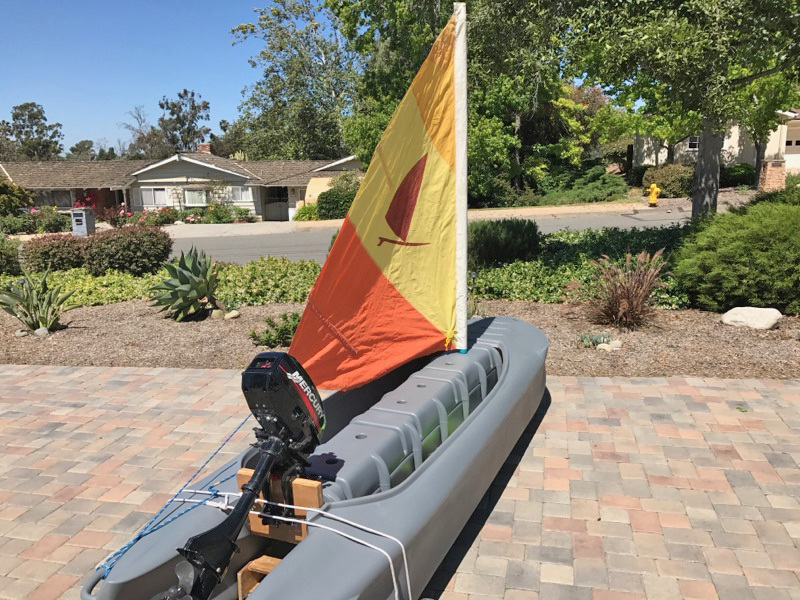 This sail rig works quite well if you have no place to go fast. … there goes my 2 cents. Rafael owns a catamaran yacht that he and his wife Heidi designed. 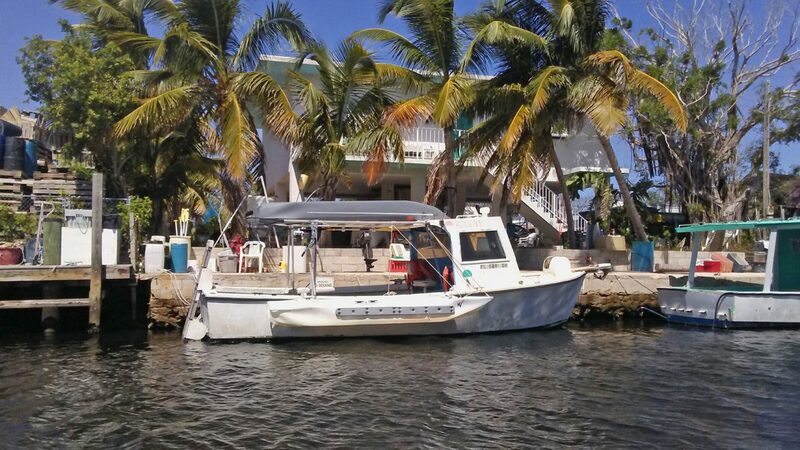 For the past six years Rafael and his family have used a Wavewalk 500 as a tender boat for it, as well as a versatile fun boat, which they sailed with a DIY outrigger. Outboard motor: I had no problem at all. Sailing by wind: I tested the W S4 in light wind, and it handles very nice. Sailing without a rudder, and without a dagger board, I can control the direction by moving my location in the W S4 front and aft. Very easy seating on the saddle. Paddle: Too bad I didn’t order an extra long paddle, because I found that my common 8 ft kayak paddle was too short. The W S4 is more stable than I expected. It’s a real pleasure. One of our friends likes the S4 and he’s thinking of getting one too. 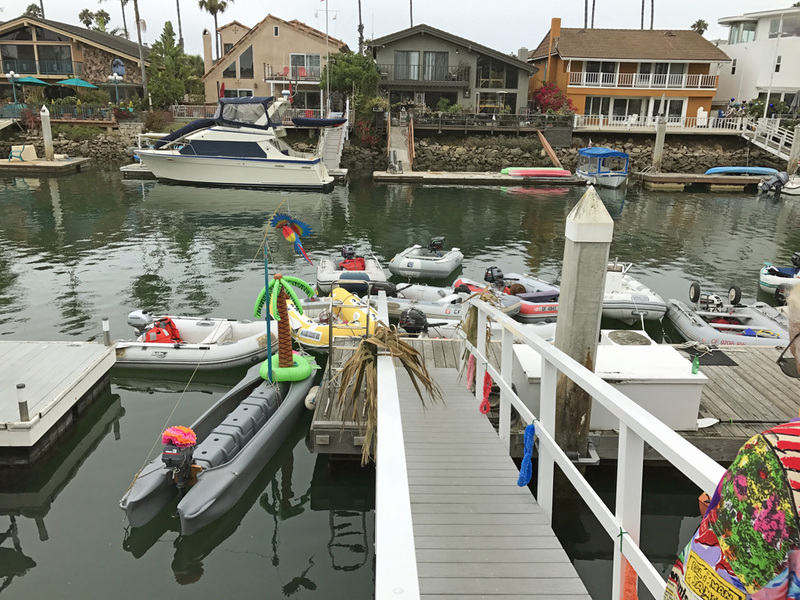 “The S-4 is alive and well, in the picture, last week the S-4 is decorated for a dinghy party. There is a lot of interest in it. In two days the S-4 is going on a camping trip to Oregon to see the Eclipse. We hope to use it on Shasta lake. When on the water the S-4 is a very stable boat, using the 3 hp Yamaha it moves very nice. Typically, a Catamaran, a.k.a. ‘Cat’ is a twin hulled watercraft that features two slender, parallel hulls of equal size, and a wide structure that’s connected to the upper sides of these hulls, holding them together at a big distance from each other. This structure makes the typical catamaran a geometry-stabilized craft, deriving its lateral stability from its wide beam and the distribution of its buoyancy along its sides, rather than from a ballasted hull, which lowers the boat’s center of gravity (CG), as a typical monohull (single hull) boat does. 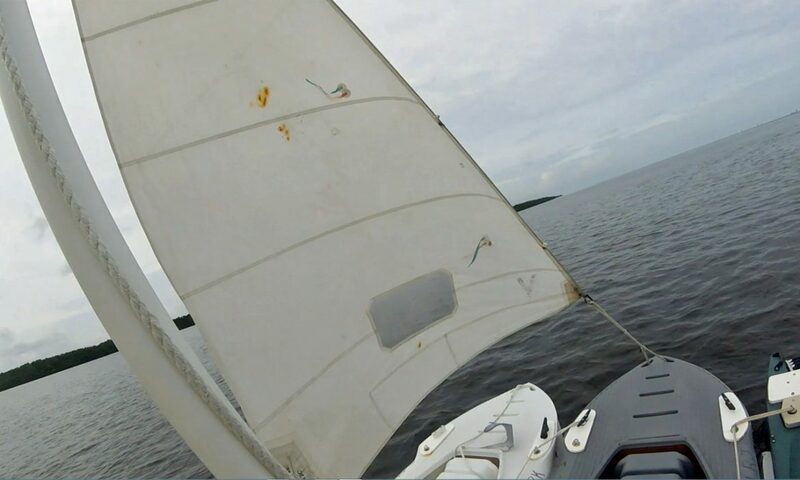 The catamaran’s two hulls combined often have a smaller hydrodynamic resistance than monohulls of comparable size, and therefore require less propulsive power. Catamarans range in size from small sailing boats and motorboats to large ships and ferries. The structure connecting a catamaran’s twin hulls can vary from a simple, lightweight frame to a bridging superstructure, namely deck from which the catamaran is operated, and can be used for carrying freight and passengers. Is the Wavewalk a Catamaran? The Wavewalk resembles a catamaran, but it is not a one in the full sense. The Wavewalk design is based on a proprietary (patented) invention – a new type of small watercraft. This patent is entitled “Twin Hull Personal Watercraft”, which is revealing of the fact that a Wavewalk is meant to serve one person, or a small number of persons, and closely interact with them. A Wavewalk is designed around the person and for that person, and it offers them the optimal means to balance themselves. Wavewalk and user are an integrated system that can achieve the most stability in a watercraft of similar size and even bigger ones. 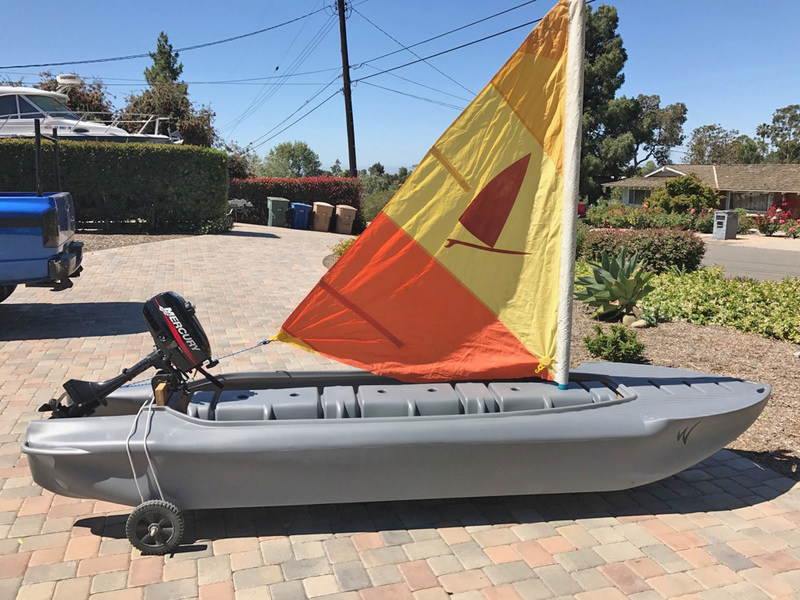 Unlike a typical catamaran, a Wavewalk is narrow – It is slightly wider than its operator, similarly to typical monohull paddle craft such as kayaks and canoes. The user of a Wavewalk operates the boat neither from one of its hulls nor from the top of a deck-like structure that bridges the hulls. 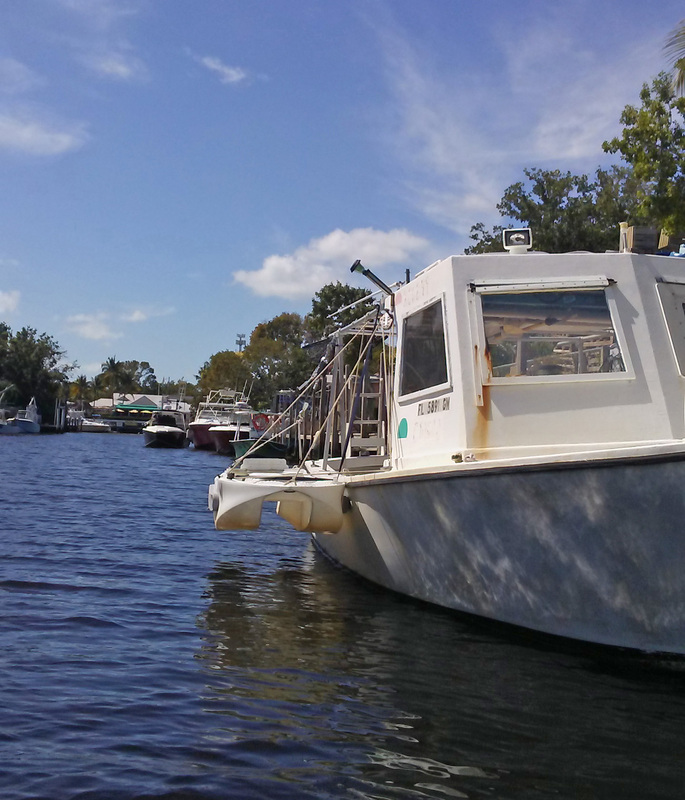 Instead, the Wavewalk user operates it from within, with a leg in each of the boat’s two hulls. The user’s feet rest firmly on the bottom of the hulls, below waterline, namely as low as possible. And this is the main difference between a Wavewalk and a typical, wide catamaran – The Wavewalk is a smaller and narrower watercraft whose design offers a hull for each of its user’s legs, and the means for them to balance themselves effortlessly, intuitively, and with the maximum effect. Another difference between the Wavewalk and a typical catamaran is the form of the structure that connects its twin hulls. This structure is called the Saddle, because it resembles the type of seat found in personal watercraft (PWC) a.k.a. ‘Jet-Ski’, snowmobiles, and all-terrain vehicles (ATV), all of which are high-performance personal vehicles. If not a catamaran, is the Wavewalk a kayak, a boat, a PWC? Thanks to its overall size, dimensions, and primary propulsion by means of a dual blade paddle, the authorities, namely the US Coast Guard, officially classify the Wavewalk as a kayak. Motorizing a Wavewalk with an electric or gas outboard motor does not change this basic classification, and when its owner registers it at the local DMV, they register it as a kayak with a motor, and not as a full fledged motorboat, and this is a good thing both for all parties involved, namely the manufacturer, dealer and owner of the Wavewalk. 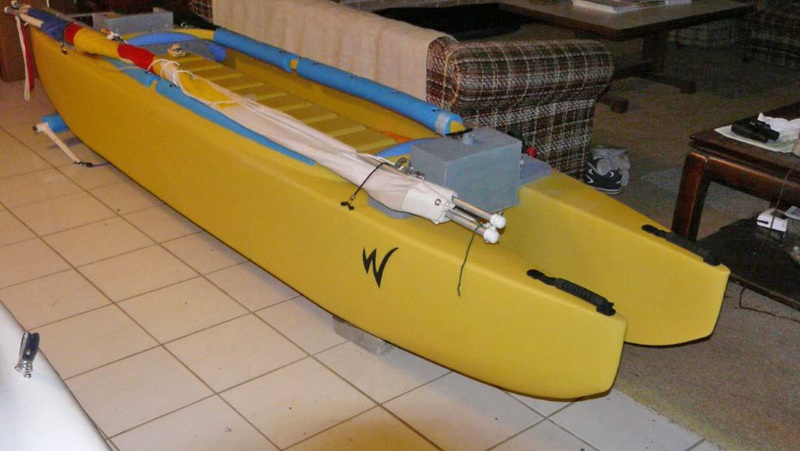 The Wavewalk is considerably more stable than kayaks are, including the wide fishing kayaks. It tracks better than kayaks, and paddles infinitely better in strong wind, which is why it does not require a rudder. The Wavewalk also offers much more storage space. But most importantly, unlike monohull kayaks that force their users to paddle seated in the notoriously uncomfortable L posture, the Wavewalk is back pain free, since it offers it users to comfortably ride its ergonomic saddle, with a leg on each side of their body. The unique combination of maximal stability and better ergonomics makes the Wavewalk such a perfect match for a motor. Riding the saddle of a motorized Wavewalk® 700 at over 10 mph is an exhilarating sensation that may remind the driver of driving a PWC, but the latter type of watercraft feature much more powerful engines, and can go much faster than a Wavewalk. Additionally, PWC are designed for instant full recovery in case they capsize, which is not the case with a motorized Wavewalk, although outfitting a Wavewalk with inflatable side flotation greatly reduces the probability of it capsizing. Even a small boat is still much wider than a kayak, or canoe, which is why it’s practically impossible to paddle a boat to any meaningful distance. This extra width gives a boat a significant stability advantage over kayaks and canoes, and typically, a normal size person can stand on one side of a boat without tipping over. But a normal size person can do this in a Wavewalk® 700 too, and this unique fact places the Wavewalk® 700 in a class of its own – a kayak that offers the stability of a small boat. Motorized, a Wavewalk® 700 offers the performance of a small boat, on top of its unique and unrivaled performance in terms of mobility, comfort, storage space, etc. Canoes can be very big, and transport dozens of passengers. The popular North American recreational canoes that measure up to 17 ft in length can take 3 to 4 adult passengers on board. While Wavewalks work perfectly with single-blade (canoe) paddles, both solo and in tandem, they can carry less payload than large size canoes do. However, a Wavewalk tracks better than a canoe does, and unlike canoes, it is easy to paddle in strong wind. … and a motorized canoe? A motorized square-stern canoe performs much like a lightweight dinghy, and as such it doesn’t work very well as a dedicated paddle craft, namely a canoe…. In addition, it is usually less stable than a typical dinghy, which is wider. Thanks to its slender, parallel twin hulls, the Wavewalk® 700 tracks better than a motorized canoe, it’s more stable, and being narrower it paddles better as well. Driving a Wavewalk® 700 is easier too, thanks to the ergonomics of its saddle, and the fact that the motor is located closer to the middle of the boat, away from its stern, which improves balance. In the sense that it works well as a skiff, namely a small, flat bottomed boat used for fishing in flats, estuaries and protected bays, yes, a motorized Wavewalk® 700 is an ultra lightweight, trailer-free micro skiff, and it can even be outfitted with a bow mounted electric trolling motor powered by a battery fed by the alternator in a small stern mounted outboard motor. This said, its form is very different. * Interestingly, the crew of competition sailing catamarans has to relocate from one side of their boat to the other in order to help stabilize it.